Though we still haven’t received anything approaching confirmation of a release date or pricing, HP’s continuing their all-out assault on the unwitting inboxes of the world. The latest email release came from HP Business Promotions, and includes both the TouchPad and the HP Slate 500 Windows 7 tablet (don’t confuse its $799 price tag with the conspicuously absent price tag for its slimmer and bigger-screened webOS cousin). While the email doesn’t reveal any new data about the TouchPad, it does give us our first glimpse at the first-party TouchPad case in its typing configuration. Discussed at Think Beyond and not seen since, the case is designed to slip around and protect the TouchPad from all sides while still allowing full access to all buttons, ports, the screen, and even Touchstone charging. Like the iPad 2’s Smart Cover (and numerous iPad cases before that), the TouchPad case is capable of folding on itself to prop the tablet up in both a vertical movie watching orientation and a at lower angle deemed to be more wrist-friendly for typing. This is the first time we’ve seen it doing either bit of origami – the typing orientation consists of folding the front flap across the back and tucking the end into a small tab in the back of the case. It’s not quite as elegant and geewhiz as the iPad 2’s Smart Cover magnetic magic, but we’ll take what we can get (and not have to deal with magnets wiping our hotel room keys and shutting off our laptops). 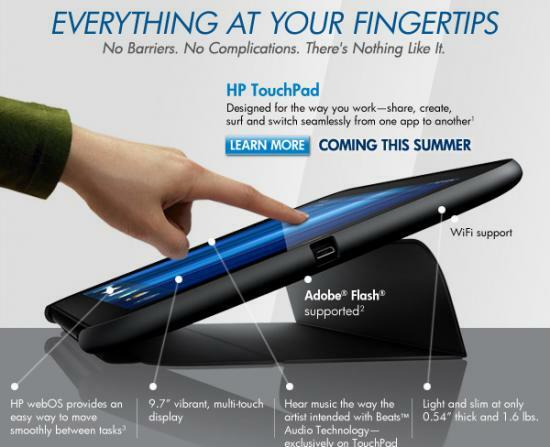 Source: HP Business Promotions; Thanks to all that sent this in!